Invisalign® Clear Braces in Washington, D.C. The adult-friendly Invisalign approach straightens teeth with customized aligners created specifically for the patient by our dentists at Washington Center for Dentistry. The clear aligner trays are made of smooth, comfortable, virtually invisible plastic that are worn over the teeth. Wearing the aligners, over time, gradually—and gently—shifts the teeth into place. The orthodontic changes are the result of exact movements planned just for the patient. There are no metal brackets to attach and no wires to tighten. Patients just pop in a new set of aligners every 2 – 3 weeks, until treatment is complete. A brand new, straighter smile emerges—with little interference in a patient’s daily life. Invisalign treats the majority of common alignment problems for adults and teens, whether a smile needs minor improvements or more dramatic change with cosmetic dentistry. From crowding or excess spacing to complex overbites, under bites and cross bites, an Invisalign cosmetic dentistry and orthodontic treatment plan can improve any smile. "I go here for my Invisalign treatment and cleanings. Dr. Deutsch and company are the best dentists i have ever experienced. I HIGHLY recommend it. The staff makes you feel like family and they..."
"Dr Deutsch has a friendly, professional, efficient team at Washington Center for Dentistry. 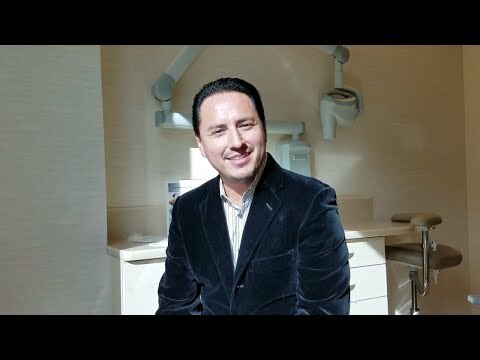 He improved my smile and health by developing a personal Invisalign plan for me. I love the practice’s upbeat atmosphere and air of quiet calm." "Staff really is great, all the way through. Front desk, assistants, and dentists. I'm getting invisalign done and besides an issue I had with the way they handled the payments on the front end and the much higher than expected cost, everything has been great. They take care of everything with no extra cost and are friendly 100% of the time." Many patients ask us: What are the benefits of Invisalign? In the past, straightening your teeth meant wearing metal braces. And although traditional braces are very effective, they can interfere with your day-to-day activities and even cause discomfort. Fortunately, you now have a choice, and many patients choose Invisalign for convenience, comfort, and appearance. Invisalign trays are virtually invisible and easily removable. Because you remove the aligner while you eat, there are no food restrictions. You can eat whatever you like. You can brush and floss normally to maintain good oral health. The smooth plastic aligners are less likely to cause discomfort than metal braces. Because the aligner trays are made just for you and are fabricated from a nearly invisible plastic, the only thing others will notice is your smile. You might be like many other adults who think about having straighter teeth, but at this stage of your life, metal braces are a total "deal-breaker." Enter Invisalign: A convenient, flexible alternative to metal braces that will give you a better smile every day. Invisible alternative to adult metal braces: The Invisalign aligners, or trays, are made of a virtually invisible plastic. In fact, you will be utterly surprised to learn how many people won’t even know you are going through treatment. It’s an added benefit not having to feel self-conscious about how you look. You will absolutely look—just like yourself. One thing people might notice is that you’re starting to smile a lot more. Life goes on without interruption: With Invisalign’s smooth, comfortable aligners, there are not irritating, metal brackets to worry about and no foods to avoid that will change your eating habits. Plus, fewer doctor visits, as Invisalign fits conveniently into your busy life. Keeping optimal oral health: While Invisalign treatment is straightening your teeth, you can still brush and floss as usual, since the aligners are removable. Maintaining good oral hygiene is a critical component of health. Consultation: From your first appointment to the final confident, new smile, it is important to select a doctor who you feel comfortable with. During your consultation, you and your doctor will talk about your case in detail, to determine if Invisalign is right for you. The features of your unique smile will determine the plan that will correct and straighten your teeth. This is an excellent time to ask questions about the entire Invisalign experience. Invisalign can easily tackle cases—from simple adjustments to more complex conditions. Customized plan created just for you: Invisalign uses X-rays, photos, and impressions of your teeth to create a digital 3D image of your mouth and smile. From these images, your doctor maps out a precise plan of the exact movements of your teeth. The plan itself dictates how long the treatment will take. Using the same technology, your doctor will show you a virtual picture of how your teeth will move in each stage of treatment. While every case is unique, Invisalign treatment usually takes about 12 – 18 months. Get custom aligners based on your personalized plan. The plan to move your teeth calls for a series of custom, clear aligner trays created just for you. Most patients get between 18 – 30. The comfortable BPA-free plastic doesn’t irritate teeth and gums like regular metal braces. Just wear them throughout your day. Remove them to eat or to brush and floss. As you wear each set of clear trays, your teeth gradually shift into place. And the whole treatment takes place without anyone knowing but you! Change aligners every few weeks. A new set of aligners every 2 weeks advances you to the next stage. Your doctor monitors progress every 6 weeks or so. Wear aligners 20 – 22 hours a day. At every stage, you can track them moving closer to the straighter smile of your dreams. Your new smile revealed. This is the moment! Big "High-Five!" Celebration! You have reached the last aligner, the end of treatment, and you will smile more now more than ever. Protect your new smile. Once your plan is complete, if your doctor recommends retainers to keep your teeth in their straight new position, Vivera® retainers are custom made with the same state-of-the-art technology as Invisalign. Vivera retainers lock your new smile into position. Cross bite: When the upper back teeth fit inside the lower teeth. Crowding: When teeth grow close together, and in some cases, overlap. Deep bite or extreme overbite: When the upper front teeth hide the lower teeth. Malocclusion: Improper alignment of the biting or chewing surfaces of the teeth. Open bite: When the teeth don’t close or come together in the front, side or back of the mouth. Over bite: When the upper jaw and teeth overlap the bottom jaw and teeth. Spacing: When there is too much space between teeth. Under bite: When the lower jaw and teeth protrude beyond the upper teeth. Straight, beautiful teeth can be achieved in a fraction of the time and without the cumbersome fuss of metal braces with Invisalign. This highly effective treatment can take your teeth from a 1 – 10 in less than a year with a set of customized aligner trays. Our dentists will personalize your treatment for your unique needs to give you the best results possible. We will work with you closely at every step to ensure you achieve your dream smile. We highly recommend that you give our office a call to find out if Invisalign is right for you.